The Costa Blanca region in south east Spain is famous for its incredible climbs and magnificent views. Cycle to the Coll de Rates and take in the expansive views overlooking the bay. The region is full of challenging ascents and thrilling descents, making it perfect for any seasoned rider. As you leave Calpe or Artea, you'll follow smooth, undulating roads that wind themselves deep into the mountains. There's a reason why so many professional cyclists ride here and that's the lack of cars and the quality of the roads. Whichever route you choose to take, enjoy the undisturbed riding that makes the Costa Blanca region so special. South-east Spain is the perfect place to visit to find some warm weather riding. With 300 days of sunshine a year, there is no bad time travel here. It is one of the few places in Europe where you can cycle all the way through the winter as temperatures still reach highs of 17 degrees. Upon arrival at Alicante airport, you will be picked up and transferred to your hotel. Where you stay is totally up to you as there are incredible options in Calpe, Moraira and Xabia however, we recommend staying in the Altea, a charming town on the white coast. Here you have direct access to incredible climbs as well as pristine beaches and lively restaurants and bars. Depending on what time you arrive, pick up your bikes and settle into your hotel before an afternoon of exploring the region. Today’s ride will provide you with the perfect introduction to cycling in Spain. The ride is made even more special as it largely replicates Stage 2 of the 2019 Vuelta a Espana. You will truly be cycling on the paths of legends. Following a delicious breakfast at your hotel, jump on the bike and head north, passing the idyllic hilltop town and popular tourist spot of El Castell de Guadalest. From here the incredible riding continues as you follow the winding mountain passes that offer inspiring views through the valleys. Ride through Benilloba and continue north to Bennimassot before the descent back into Altea begins through Castell de Castells and Tarbena. We recommend a quick stop at the latter where there’s a pop-up drinks shack, perfect for cyclists out riding in the mountains. There’s a strong chance you won’t come across any cars during this ride. Enjoy the uninterrupted freedom of the winding tarmac roads all whilst taking in the unique mountainous landscape. On return to your hotel, tuck into a traditional Spanish meal and relax after an incredible first ride in Costa Blanca. Arguably the most well-known climb of the region, the Coll de Rates is a must ride for any seasoned road cyclists. After a relaxed morning in your hotel, join the roads leaving Altea to the north and reach the peaceful village of Parcent. 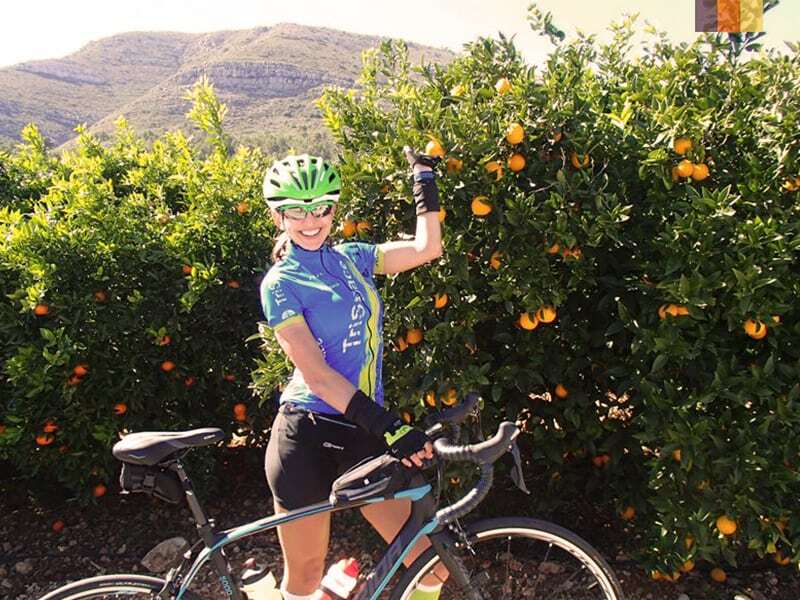 From here, we recommend a ride through the Jalon Valley, where you can take in the orange groves and peaceful surroundings, before heading south towards the famous Coll de Rates. During the ascent, our GPX routes will take you onto the narrow winding roads that make this region so famous. Too narrow for cars but made from smooth tarmac, this is the definition of climbing and switchback heaven. All routes in the area provide riders with unforgettable lookouts overlooking the coast. The climbing is easy when the views are this good. Today’s ride begins with some spectacular coastal riding. Ride from Altea to Calpe and through Moraira, Xabia and Denia before heading inland on smooth roads cut into the sides of rugged mountains. You’ll then come to a town called Planes. A delightful checkpoint that has been one of the most frequently visited places in the Vuelta a Espana in recent history. Don’t be surprised if you come across professional riders during today’s route. The quiet roads and abundance of climbing opportunities make it the perfect training destination. Enjoy another unforgettable route through the mountains on your way back to Altea. If this is your final day on the bike in Costa Blanca then take it all in and enjoy the freedom that the roads provide. Relax in your hotel or head out and experience the local restaurants and bars to conclude your cycling holiday. If today is your last day in Altea, a transfer will arrive to take you back to Alicante airport after your bikes have been picked up. Relax this morning and take your time chilling out on the south-east coast before your onward journey. 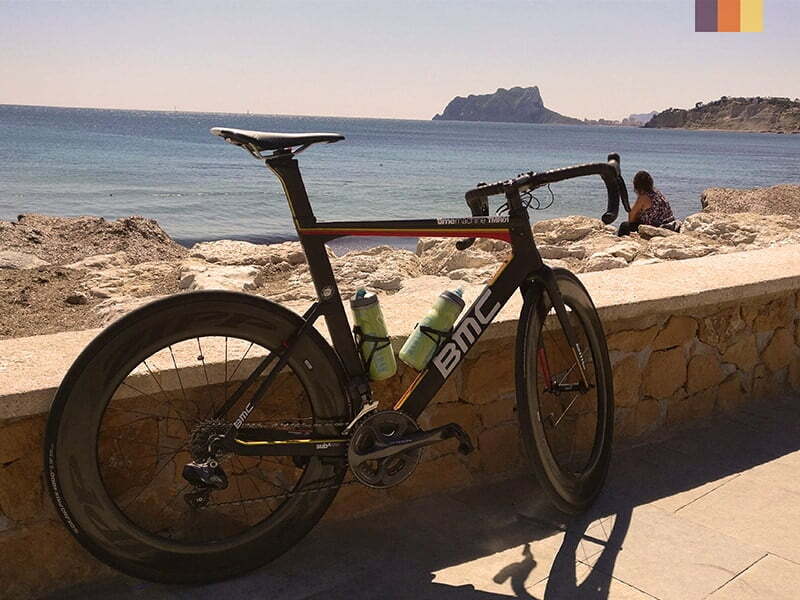 If you choose to extend your trip, we can provide you with more incredible routes to ride and, for a change of scenery, we also love staying further along the coast in Calpe where you can enjoy days exploring the town and climbing Calpe Rock (Peñón de Ifach). Just let our cycling experience team know when you enquire. The cycling season begins as early as March and April which offers cool Spring riding. Temperatures in early Spring are perfect for cycling and this is one of the most popular times to ride here. The weather gets progressively warmer towards the end of May. The east coast of Spain is hot in the summer and can be quite humid. This is tempered by the breeze on the coast so you can enjoy some excellent coastal cycling in the summer. The best time to cycle in Spain in the summer is early in the morning before the midday sun. Autumn, like Spring, is a great time to cycle in Spain. The summer heat has passed and the weather becomes cooler. All through Autumn you will find ideal conditions for a ride and the crowds will be reduced after the busy summer period. Winters are generally colder in this region of Spain however you can still enjoy some perfect riding. With temperatures reaching 17 degrees in December last year, there is never a bad time to visit the Costa Blanca. What makes south east Spain so special, along with the beautiful weather and incredible climbs on offer, is the freedom that the mountains and roads provide. As you venture north into the hills, don’t be surprised if you don’t come across a car for hours. Stay in Altea, Calpe or Xabia and enjoy rides along the coast or into the mountains at your pleasure. The mountain passes here stay open all year due to the region’s excellent weather. Ride the Coll de Rates and to Tarbena and Planes, 3 incredible routes that only touch on the surface of the incredible cycling in the Costa Blanca. Where you stay is totally up to you. All along the Costa Blanca coast, you'll find beautiful accommodation options from 5* boutique hotels to quieter, family-run residences. Our favourite place to stay is in Altea where you can make use of golf and yoga facilities and enjoy direct access to the beach. This is the ideal location to head into the hills on the bike with the Movistar and Sun Web Pro Cycling Teams recently spending time here. You will be picked up at Alicante airport at the start of your trip and taken to your hotel in Costa Blanca. A return shuttle service will also be provided. GPX Routes will be provided on your cycling holiday in Costa Blanca. The mountains are very well signposted due to the extensive number of cyclists that use them however the GPX routes will also guide you to the best climbs and roads in the area. If you prefer a hard copy of the routes this can also be arranged. We have a wide range of road bikes for you to choose from during your cycling holiday. Our standard model is a carbon road bike with Ultegra groupset however if you would like to upgrade this just let our cycling experience team know and we can run you through the options available. There is an option for guided rides in Costa Blanca. You can choose to join in on the group rides that run 5 days a week or we can organise a 1:1 guide for you. This is a great way to explore the region under the supervision of an experienced local guide. Just let us know if you'd like to do this when you enquire. You will also be provided with a puncture repair kit, a cycling computer, Shimano or Look Pedals, 2 water bottles and cage.